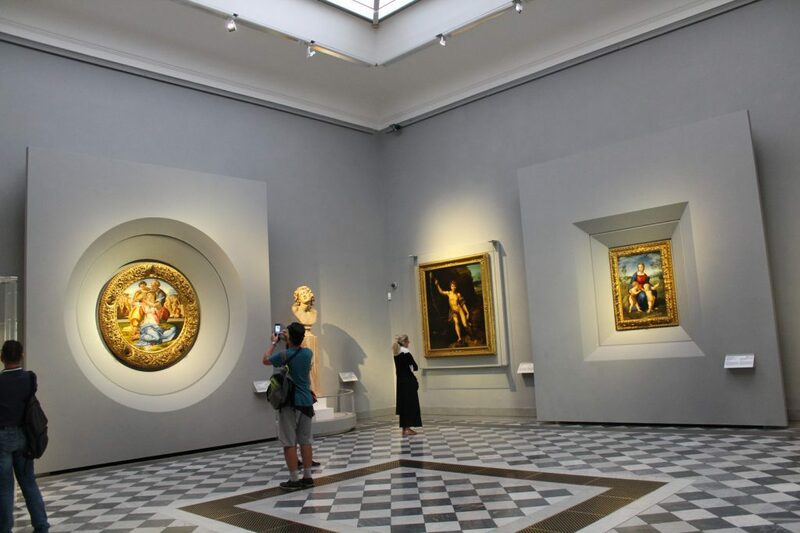 Visit to the Uffizi Gallery: what to see and handy useful tips! My visit to the Uffizi Gallery. 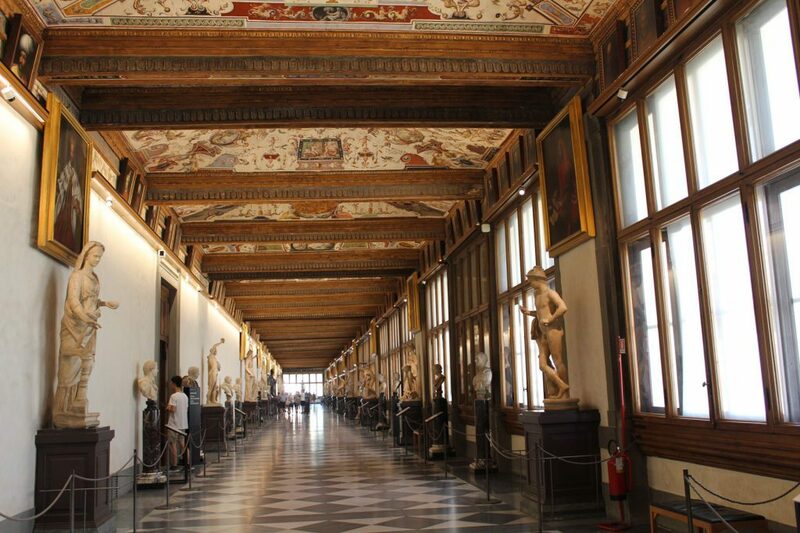 The Uffizi Gallery is a place that does your heart good. The Uffizi finds ways to amaze even the most frequent visitors, so it doesn’t matter if you’ve been there a dozen times. This was exactly my experience this morning. The heat and long lines are great reasons to book your ticket online, so you can skip the line, streamline the entry procedures, and avoid wasting time. After the metal detectors, you can leave your heavy bags guarded in the bag check. I personally like to go through museums not carrying much. I leave my purse and just keep my camera to start my visit. We take the staircase up to the first corridor, the western one. The many rooms along the corridor are linked to each other. The first room I visit is, as always, the Majesty room. 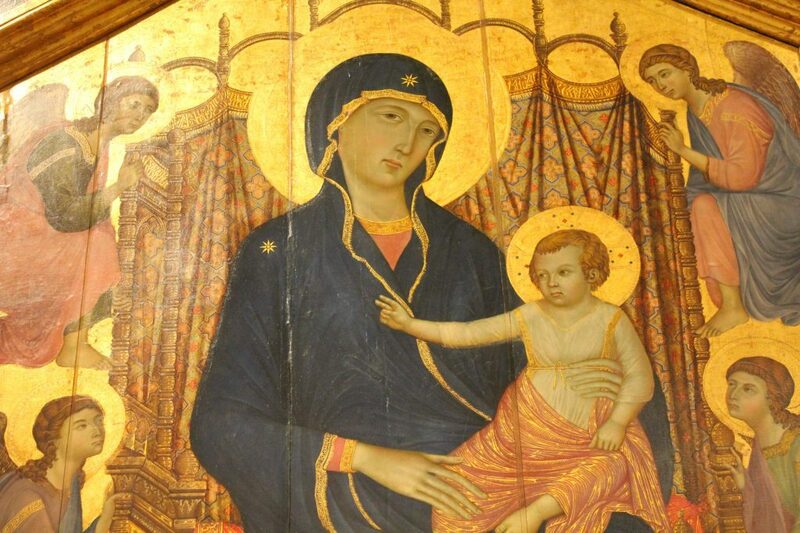 Three of the greatest artists of the 14th century are placed side by side: Cimabue, Duccio di Buoninsegna, and Giotto. The three pieces are joined by gold, stylistic touches, and majesty. Every time I see them they seem even grander. I stroll through International Gothic art works and in the room for Gentile da Fabriano, and then get to Filippo Lippi, Piero della Francesca, and Paolo Uccello. Here the sweetness of Lippi’s Madonna with Child and Two Angels contrasts with the stark profiles of the Dukes of Urbino and with the war theme. 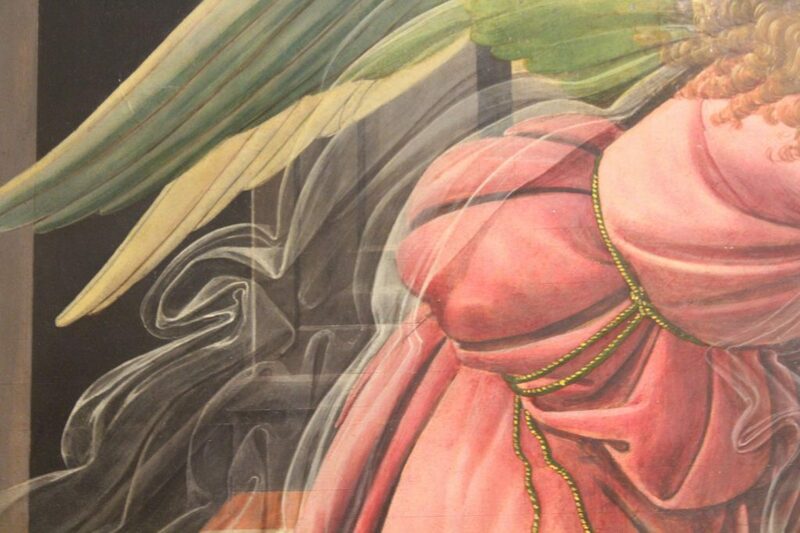 We finally get to the new Sandro Botticelli rooms. The neutral white frame’s goal is to emphasize the iconic art works of the Florentine artist Botticelli, an emblem of Italian art, famed for his Birth of Venus and Primavera (or the Allegory of Spring). Departing for a moment from popular consensus, I’d like to point out the beauty and complex stories told by other pieces in the Botticelli room: The Calumny of Apelles, Pallas and the Centaur, and the Annunciation. Many of these events refer to the painter’s personal life, the city of Florence, and the Medici family. We come upon Francesco I’s Tribuna, go through the corridor, stroll through sections of Roman art and get to Leonardo’s room. The three masterpieces, the Annunciation, the Adoration of the Magi and the Baptism of Christ, emerge from the room’s shadows to illuminate it. 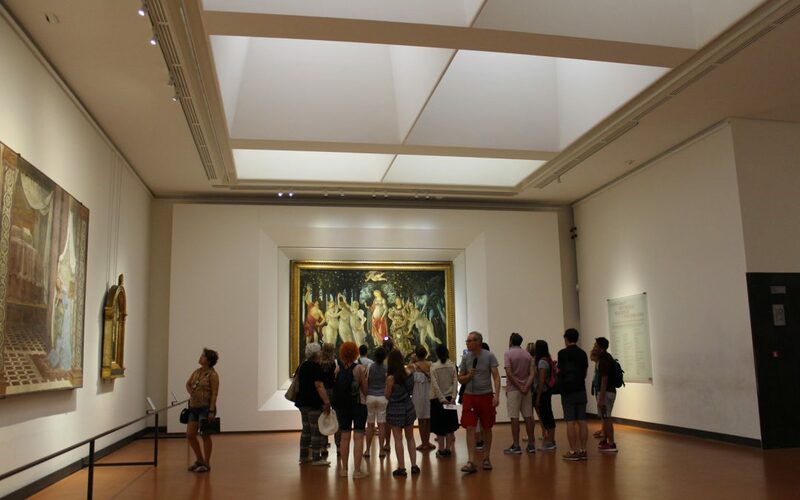 One of the main reasons I was so eager to go back to the Uffizi was to check out the new design for this room. I had read many reviews about it, most negative. I’ll be honest: I like the white that dominates the room and the juxtaposition of Raphael and Michelangelo’s paintings. It creates a nice connection for visitors entering the room. But I don’t know about the white frame for Doni Tondo. I would prefer something that completely surrounded the piece’s circular shape rather than breaking it up with the square frame as this new arrangement does. Still, the masterpieces are nicely showcased, and seeing such emblematic works helps us rediscover the beauty preserved within this museum. We head towards the last part of the western corridor. 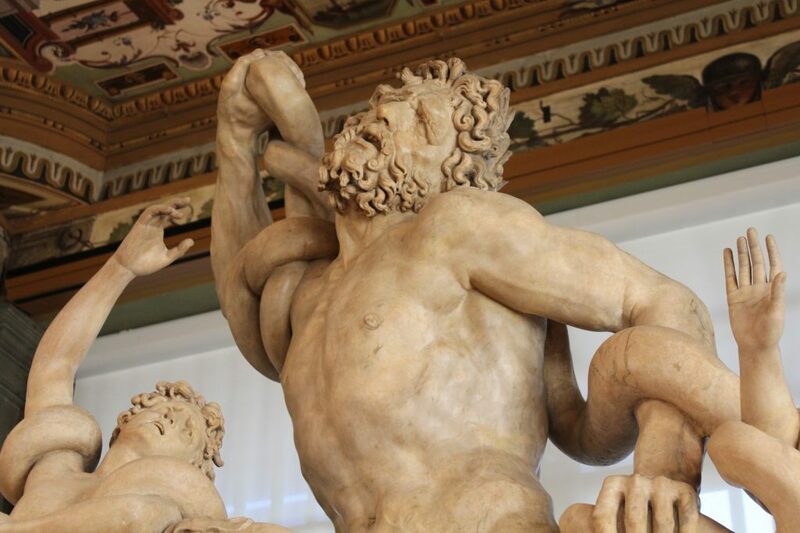 At the end, we come to the reproduction of the Laocoön and His Sons (the original is in the Vatican Museums) and Pietro Tacca’s Porcellino (you can admire the original at the Bardini Museum). We continue to the coffee shop, right on top of Loggia dei Lanzi, which gives us a panoramic view of Brunelleschi’s dome, Giotto’s bell tower, and the Tower of Arnolfo. It’s a view to take your breath away! Coming down to the first floor and the red rooms, we discover Pontormo, Rosso Fiorentino, and Andrea del Sarto. New visitors are sure to be dazzled by their original, dramatic, and anti-classical style. 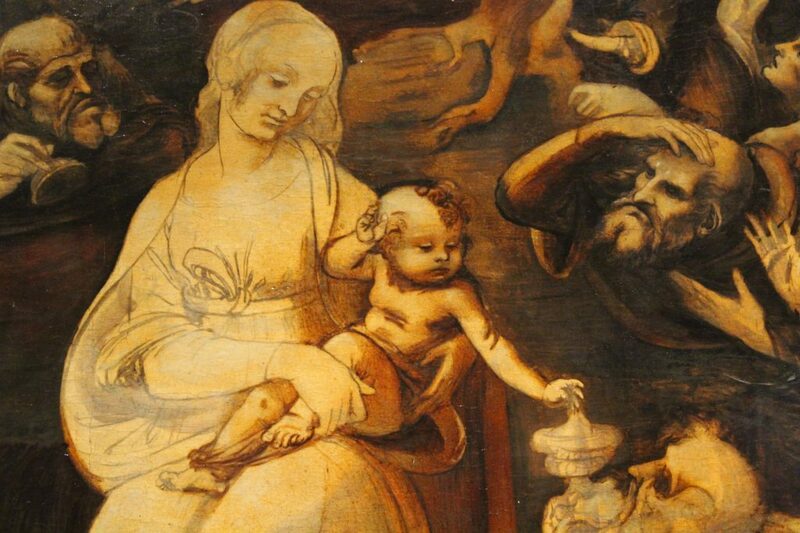 They would have never expected to catch sight of the features of a little devil in the representation of baby Jesus. My visit is almost at its end. After going through the temporary rooms that hold Artemisia Gentileschi’s Judith Slaying Holofernes (doing it little justice), we catch sight of Caravaggio. 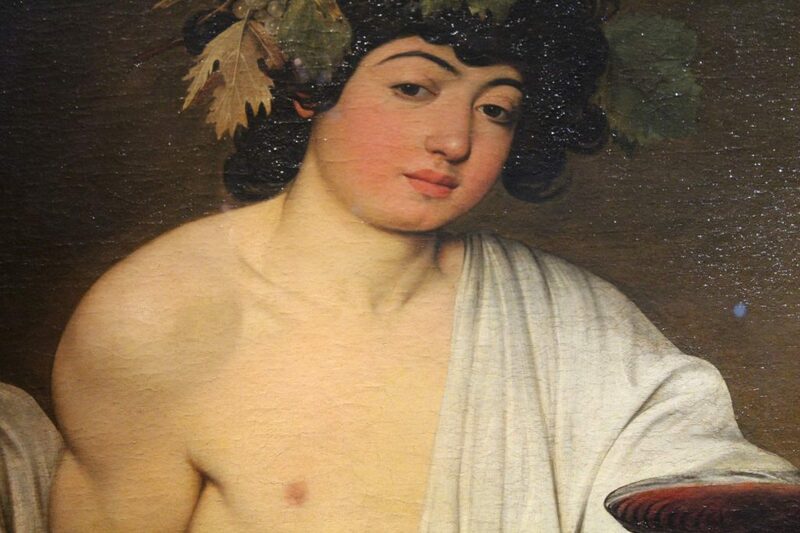 The Medusa and the Bacchus are now in two separate rooms that group the art works according to the themes depicted rather than not the artist who made them. Caravaggio’s power and realism always hit viewers with the strength of a fist to the gut. After you’ve visited the Uffizi Gallery, you’ll understand what I meant when I said that this place does the heart good!